As someone who’s cold basically all the time, I have a soft spot for all kinds of layers: sweaters, jackets, sweatshirts, you name it. Alala has been hitting the sweatshirt game hard, so I was really excited to have the chance to try out a whole slew of their current styles. Here’s how they shook out. And lest you think that there’s only one way to wear an active fashion sweatshirt, I mixed in a few different styling options to keep things interesting. Sizing note: I’m wearing size XS, my normal size in Alala, in all of these tops. Disclosure: thanks to Alala for generously gifting me these sweatshirts to style and review. All opinions are my own. When I was a tween, I had this blue fleece sweatshirt with bell sleeves that I absolutely LOVED wearing. This stance hoodie reminds me of that top, but with a decidedly more modern, grown-up touch. It’s made of medium-weight french terry with a relaxed, slightly cropped silhouette. I love the cobalt color oversized contrasting pulls at the hood. The sleeve hem is semi-unfinished. It has a raw look, but there’s a seam just behind the raw edge to keep it from unraveling. So, if you want to shorten the sleeves, you’ll need to sew down the end rather than simply snip it off. As you can see, the sleeves are quite long as manufactured. The heron sweatshirt is a lightweight option for milder climates. The micromodal material is incredibly soft. Along with the rise dolman below, this ties for the prize of softest sweatshirt in this post. 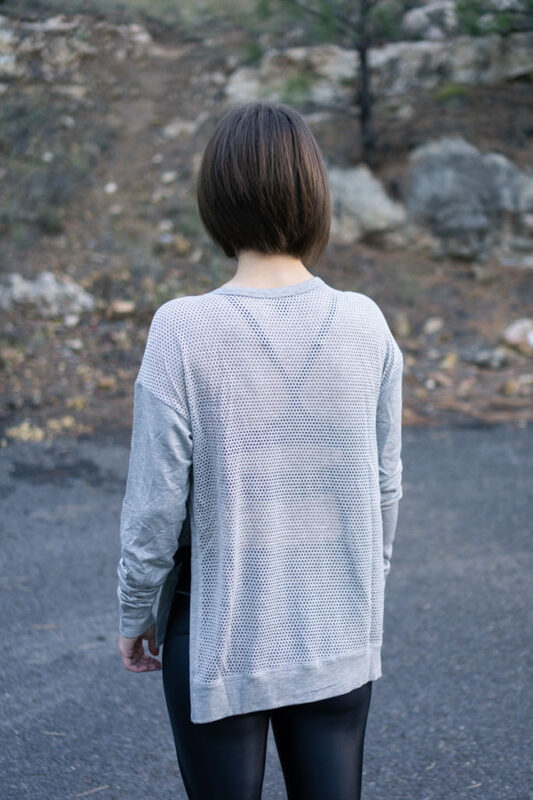 The open-knit back and side slits provide a little air flow for breezy nights where you don’t need as much warmth. Besides casual wear, it’s a nice layer for mellow studio classes like restorative yoga. Flares aren’t just for sleeves! I rarely see bootcut workout pants anymore, but I wanted to bring them back with this outfit. I added some fresh white sneaks to complete the almost-retro look. It’s totally different than any other outfit in this post, but I’m digging it. The stance pullover is a french terry top with a relaxed fit. Although it mostly fits similar to the hoodie of the same name, note that the pullover version is about 1-2″ shorter than the hoodie. As you can see in the pics, the pullover is a true crop, hitting right around my belly button. Wear a tank underneath or pair it with high waisted pants if you want to minimize skin exposure. 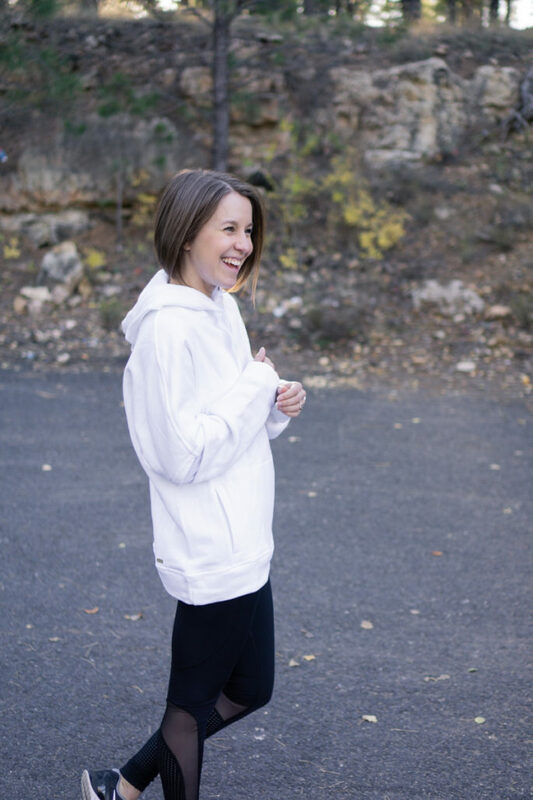 The shift hoodie is so cozy and is a fabulous casual look with leggings. I wasn’t sure what I would think of this one, but the more I wear it, the more I like it. In fact, I wrote most of this post wearing it. The fit is oversized and bum-covering for extra warmth. The french terry material is warm and cozy, and the kangaroo pocket gives you a place to warm your hands. The sleeves have a zipper detail to elevate it from your average hoodie. I prefer to wear the zippers unzipped so that they don’t bounce against my hand. The zippers are thick and metallic, no flimsy plastic here. This was one of the best of the bunch for me. I went in a totally different direction with the cypher sweatshirt by pairing it with a non-active look. 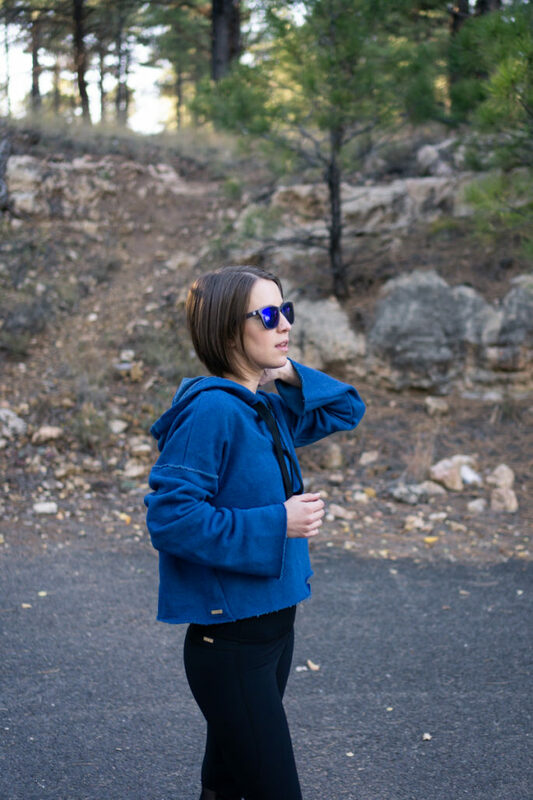 Sweatshirts aren’t just for workout leggings! I love the contrast of distressed details with a more polished look from the suede boots. If you’re worried about destroyed details looking sloppy, try pairing it with more refined details help to balance out the look. This sweatshirt has exposed hems, intentionally unfinished seams at the neckline and hem, and slashes along the arms. 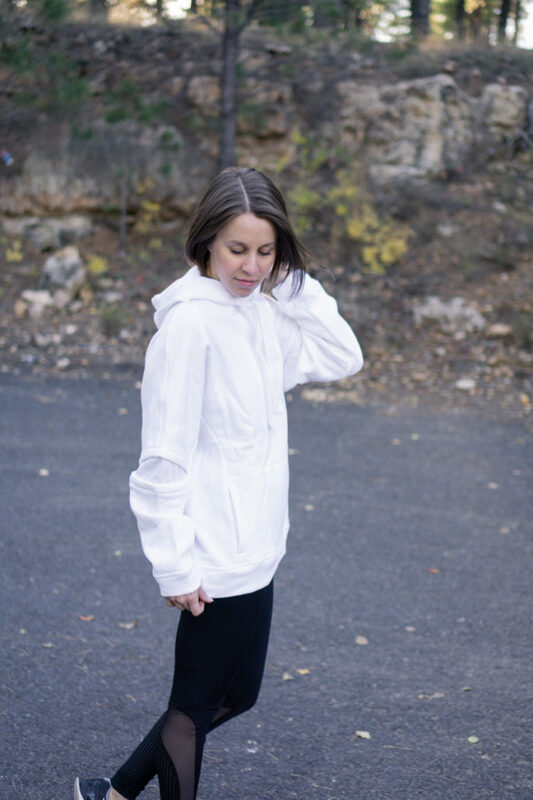 It’s made of a medium-weight french terry and has a relaxed, but not oversized fit. Since there’s no hood and it’s not too long, it’s good for layering both under and over other layers. 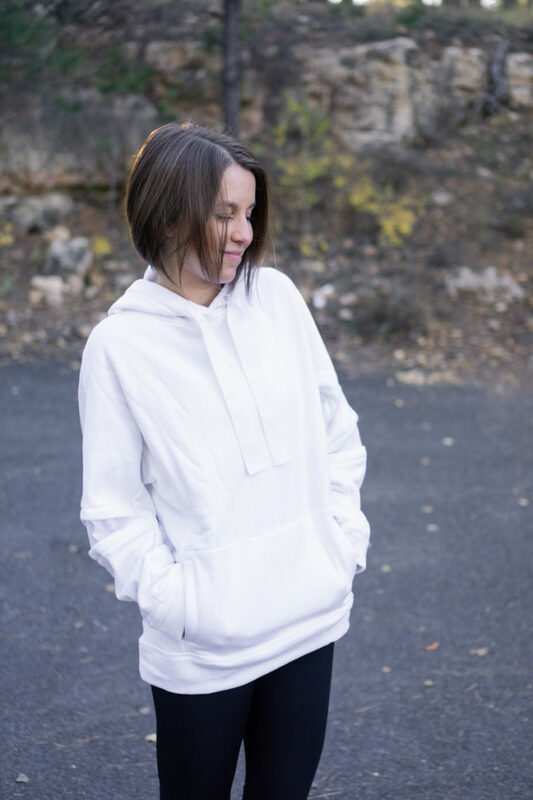 I’m a big believer in wearing white anytime you want, and this notch hoodie is no exception. It’s a pure white, not cream or ivory. I’m always fond of a monochromatic look like this one here, but it also looks great paired with jewel tones, like a rich shade of burgundy. 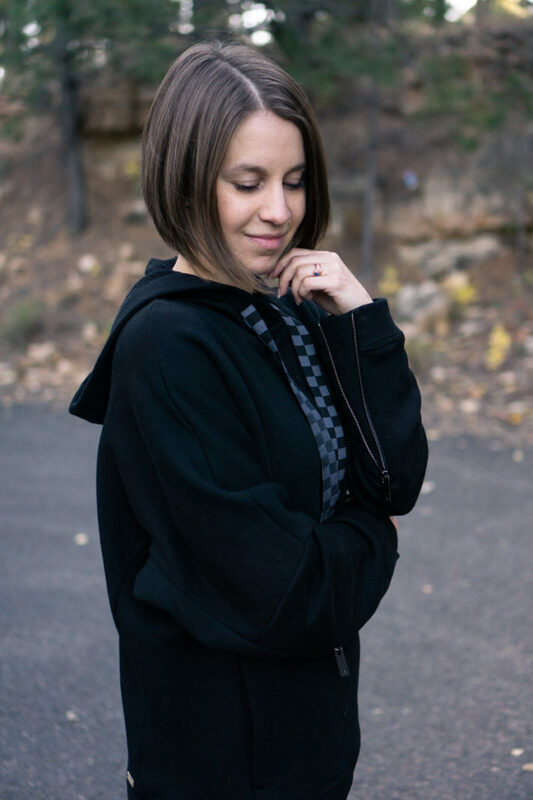 The notch hoodie fits long like the shift hoodie, almost totally covering the bum. 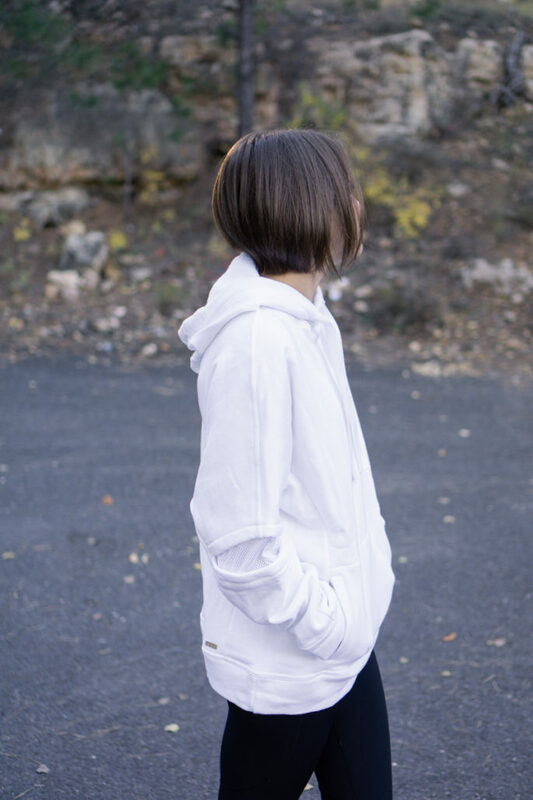 Like the shift hoodie, it’s also made of french terry. 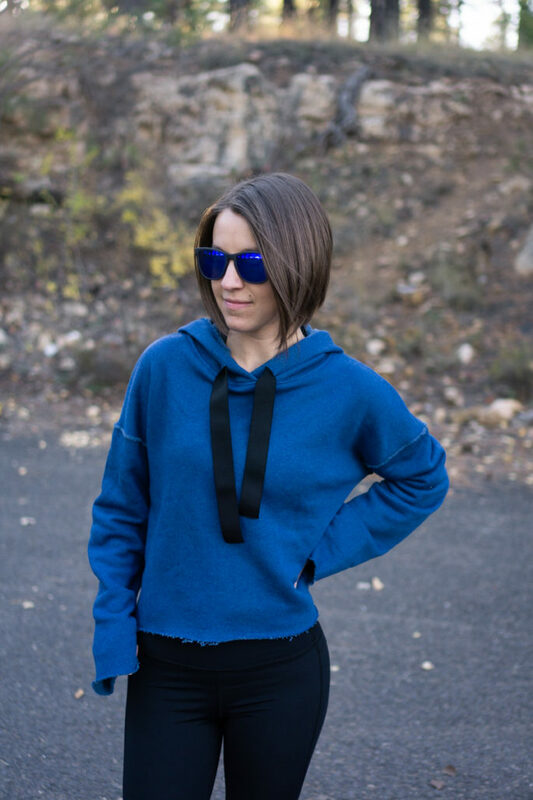 Instead of the zippers at the sleeves that the shift hoodie has, the notch hoodie has slits at the elbows. I didn’t notice losing much warmth out of the slits. I also love the white color because it hides my dogs’ fur, which is a permanent fixture on everything I own. Just make sure you stock up on stain remover (I like powdered OxiClean) to keep it looking sharp and bright! 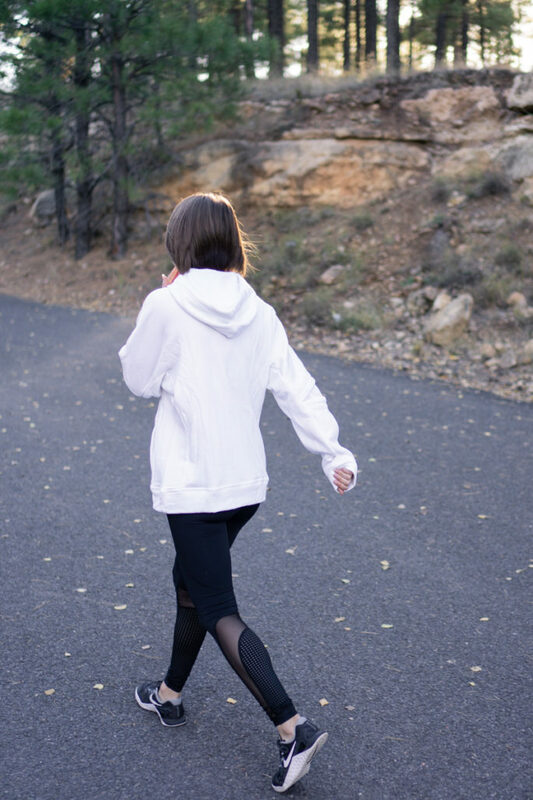 The rise dolman is a lighter weight hoodie that’s good for layering. The closer fit means you could still throw a jacket over top of it. Instead of french terry, it’s made of a mix of ribbed and flat material, both of which are unbelievably soft. 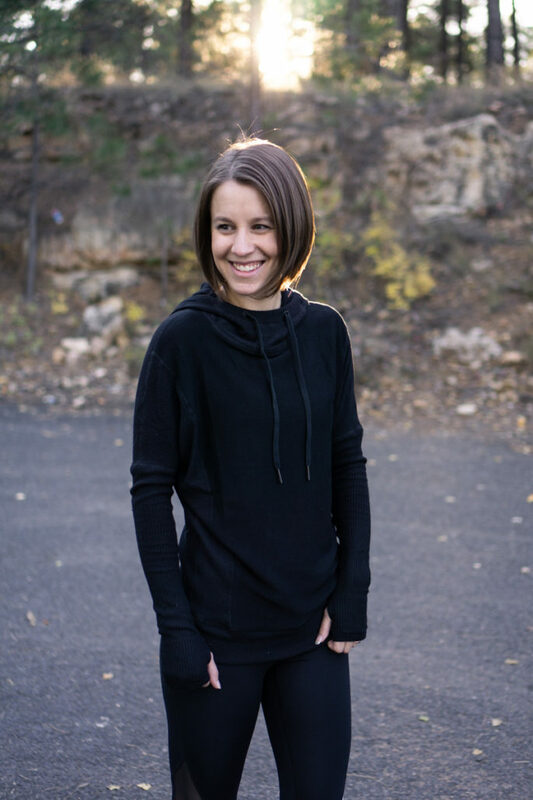 This is also the only sweatshirt in this post with thumbholes, which I love. Although it’s still a relaxed fit, it’s not oversized and fits closer than the other sweatshirts in this post. It has a particularly sporty look that pairs especially well with workout tights. This one is my personal favorite out of the 7, and I predict I’m going to be wearing this one over and over this season. great post! I miss seeing fit reviews from you, so was delighted to read. Thanks for putting alala back on my radar- been a while since I ordered. I’m wearing bootcut right now, lol. Outdated, or not, I love the look :) I missed your fit reviews. Thank you! Yay, another one for club bootcuts! :) If only I didn’t have to hem them every time, hah. Trying to mix in more fit reviews in the next couple of months–hopefully you’ll see more soon! Usually I think everything you wear looks great, but I didn’t like any of the first 6. I hate the unfinished seams and distressing, and the fit was generally way too oversized and sloppy. The last one I like and I feel like you would actually purchase it. I do love all the leggings you paired them with though! Yeah, a lot of the first few are similar so I definitely imagine that if you don’t like one, you won’t like most of them. The distressed, oversized look seems to be in with a lot of brands lately so it was fun to give it a try myself! Wow, those are all over the place, aren’t they? I like is the second one but I’d need a camisole or something under it. The ripped one, well, I admire your attempt to dress it up but I can’t imagine anyone actually buying it. It’s so surprising to see you in “baggy” hoodies, I’m used to your form-fitting style! I felt like the last one seems most aligned with your usual outfits! I’m not sold on the slightly flared sleeves for an athletic wear line.